Bauer Tuuk LS3 Edge Steel Runners - Senior is rated 4.0 out of 5 by 12. The Bauer LS3 Edge Sr Steel is a great replacement steel choice in steel for players wearing Tuuks LS2 Edge holders. The trigger system guarantees players the fastest emergency change time possible. Additionally these blades also feature a higher profile, allowing for a tighter turning radius and more sharps before they're spent. Rated 5 out of 5 by Diamond Sharp from Good product, fast shipping Bought these for a customer at my shop who needed them within a week. They arrive with a couple days to spare with standard shipping - free to Breakaway members. Price was standard manufacture retail price, but main thing was TH got them out to me on time. Rated 2 out of 5 by Zamboni driver1 from Questionable quality I purchased my LS3s one month ago to replace a broken pair of LS2s that I skated on for 4 years. Without changing my routine for drying the blades, the LS3s have more rust spots on them now than the LS2s had at the time they broke. I hope this is an exception with the quality of Bauer products these days, but I have a feeling it's not. Rated 5 out of 5 by hrach0 from LS3 Edge Steel Pair Great product. got the product quick. just make sure to check the mm and not go by the Boot size only. There is a difference between ls1 and ls3. Rated 2 out of 5 by ChipB from Have not had the best of luck with these.... So I got these for my son who is a u14 player. Not a top level player but plays in a decent league. It seems he loses an edge pretty much every game over the course of his past 5 games. We figured we would give these a try as a move up from the LS2's but quite franky, the steel just does not seem to hold up. Maybe a bad batch? No idea but he never really had an issue with the LS2's. Maybe he will go back to them on his next pair. Both LS3 and LS4 have a working radius of 10' but the shape of the two blades are different. The LS4 is more ready to go right out of the box. The LS3's heel and toe are unshaped more or less. You may need to get both blades profiled to your exact wants and needs. We suggest skating in them first before you make any changes. Thanks! The Bauer LS3 is not black steel, so running a stone down the side will not cause any harm to the blade. I just bought a pair of Bauer Vapor X-Shift Pro skates size 9D and was wondering if you carry Black LS3 replacement steel for the Size 9 Vapors. You only show even size replacements on your webiste. According to the size chart they require 280mm. You would want size 9 runners, but unfortunately we are out of stock in size 9 in both LS3 and LS4 edge runners at the moment. We only have LS2 edge. What steel runners would for 2006-7 model vapor xox? Or are they still universal for bauer? They are not universal. You would need a runner that is not the EGDE as your holder on that skate would not have the EDGE trigger technology on it. 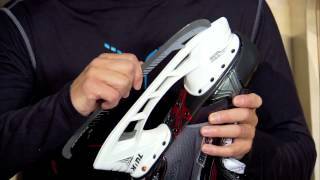 How long do these blades and holders stay in stock I just purchased a pair of 2014 Bauer Nexus Skates and plan on using the skates for at least 5-7 years. Should I buy the blades and holders now or do these stay in circulation and stock? I play C league. Bauer switched to the Edge design only a few years ago, and it is likely that it will stick around for quite some time. It never hurts to have backups just in case, but I would not say there is a rush of any kind at this point. I ordered the wrong size..can I return and order the right size blade? how should I do this? Bought the Bauer MX3's that came with the Fusion blade. Why would such an expensive blade start to bend? &nbsp;I weigh 270 lbs and skate 3 times a week and never had this issue before. Just ordered the LX3 blades. &nbsp;What gives with the Fusion blade bending? The reason for a bend in steel can vary from case to case. Please contact us at [email protected] or 866-929-6699 and we can go over your situation more specifically.